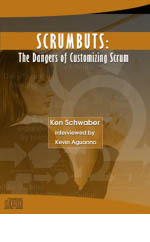 The use of Scrum is rapidly spreading, and the occurrence of "ScrumBut" is equally rapid. A Scrum But is when an organization adopting Scrum has changed Scrum, under the logic of "We use Scrum, but we've had to change it because in our organization we ... "
Listen to this 60-minute interview with Ken Schwaber, the co-creator of the Scrum method, as he gives an overview of ScrumButs and then answer questions about some common Scrum Buts that he has encountered. Hear from the expert the dangers of customizing Scrum inappropriately and the problems that arise from an incomplete Scrum implementation. Purchase this 60-minute teleconference to learn about ScrumButs and how you can avoid them. What are the most common inappropriate customizations and incomplete implementations? What risks and problems result? What are the safest ways to tailor Scrum?